The Tennessee State Library and Archives houses a rich and varied collection of original, commercially published, and microfilmed legal and legislative documents. This material can be of use to legal historians and scholars, as well as to those individuals seeking information about current Tennessee legislation and laws. Listed in this brochure are some of the most frequently requested items. The library owns much more than the few titles listed here, and anyone looking for such material should always consult the State Library and Archives website for additional information. The listings of material in this pamphlet are arranged by the area of the library where you can request them. If you are a first time visitor, maps are available for each public area in the library. The Tennessee State Library and Archives is not a law library in the conventional use of the term. It is more than that—it is a repository of unique materials that includes such varied items as the original bills of the Tennessee General Assembly, rare copies of the earliest compilations of Tennessee state laws, the original Acts of Tennessee, and other such resources. 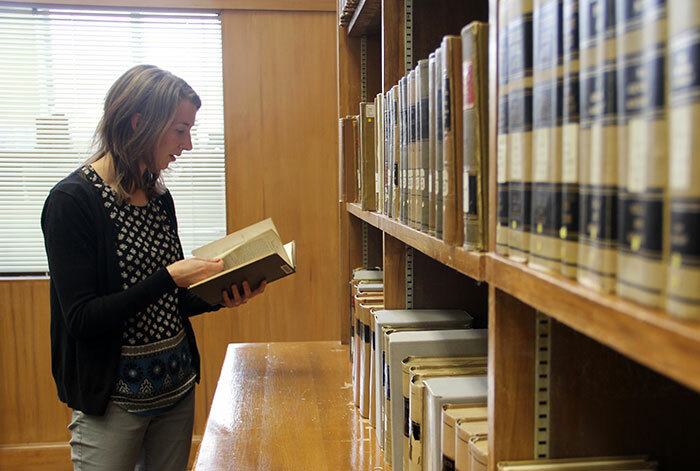 A fundamental part of any state’s history is the development of its laws, and the Tennessee State Library and Archives holds the history of Tennessee law. These are published copies of the opinions of the Tennessee Supreme Court. Opinions from the 4th Quarter to the present are also available online. A monthly publication devoted mainly to the development of rules governing state agencies, but also contains announcements related to financial institutions and other matters. Back issues from January 2000 to the present are available online. The bound opinions of the Tennessee Attorney General begin with 1971. Opinions from 2000 to the present are available online. The following Record Groups in our Manuscripts Area also contain some Attorney General's opinions: RG 18 (opinions dating from 1899-1912), RG 109 (opinions dating from 1872-1902), and RG 241 (opinions dating from 1906-1969). The current Blue Book is available online. A six-volume collection of biographical sketches of Tennessee's legislators covering the years from 1796 to 1991. Our holdings include the published proceedings of the Tennessee Constitutional Conventions of 1796 (J87.T23a-10a), 1834 (JK5225 1834.A22), 1870 (JK5225 1870.A6), 1953 (JK5225 1953.A22), 1959 (JK5225 1959.A22), 1965 (JK5225 1965.A22), 1971 (JK5225 1971.A22), and 1977 (JK5225 1977.A22). Original bills of the Tennessee General Assembly (1796 through the most recently concluded legislative session). The text of House & Senate bills and their amendments for the years 1995 through the present can be found in the Legislature’s online archive. Published copies of the Public and Private Acts of Tennessee (1796 through most recent available on paper). The text of Chapters for the years 1997 to the present can be found online at the website of the Tennessee Secretary of State. Audiotape recordings of the Tennessee General Assembly (1955 through the present). Availability of tapes in early years varies. Check with staff for exact dates. The charge for research and copying of these materials varies. Check with staff for specific information. The text of recent House and Senate Journals can be found online. Copies of superseded Rules and Regulations of the State of Tennessee (1976 to the present). The format varies for this publication; depending on the year, material may be on paper, microfilm or disc. Check with staff for exact location of any previous years. KFT35 1975 .A2. The text of current Rules and Regulations can be found online at the website of the Tennessee Secretary of State. Published copies of the current Tennessee Code Annotated. The text of the current Code, without the annotations, can be found online. Although this is a commercial website, there is no charge for access to the Code. For copies of previous editions, ask at the desk in the South Reading Room. Superseded copies can be obtained by requesting them at the desk in the Tennessee Room. Weekly newsletter covering actions in the Tennessee General Assembly & other matters in Tennessee politics. Frequently requested report concerning the Criminal Sentencing Reform act of 1989. Chancery, circuit & county court records for all Tennessee counties. Availability and dates vary greatly from county to county. A county-by-county listing, including dates available and State Library and Archives microfilm roll number, is posted on our website . Tennessee Prison Records, 1831-1992. (RG 25). These are microfilmed copies of the original records. Minute Books of the U.S. District Court for West Tennessee, 1797-1893, and of the U.S. District Court for Middle District of Tennessee, 1839-1865 (MF#869). Final Record Books of the U.S. Circuit Court in Nashville: vol.1, 1808-1812 & vol. 2, 1812-1820 (MF#868). Supreme Court Trial Cases, 1796-1955 (Record Group 170). Supreme Court Clerk’s Records, 1810-1955 (Record Group 191). Supreme Court Administrative Files, 1903-1921 (Record Group 6). Supreme Court Trial Dockets, 1817-1936 (Record Group 164). Supreme Court Administrative Records, 1907-1961 (Record Group 186). Attorney General & Reporter Records, 1899-1912 (Record Group 18); and Attorney General & Reporter Records, 1906-1969 (Record Group 241). Attorney General Opinions, 1872-1902 (Record Group 109). Tennessee Constitutional Convention Records, 1834-1977 (Record Group 46). Acts of the Tennessee General Assembly, Public & Private, 1790-2004 (Record Group 260). Tennessee Code Commission Records, 1953-1955 (Record Group 105). Law Revision Commission Records, 1963-1976 (Record Group 49); and Law Revision Commission Records, 1970-1976, (Record Group 71). Judges of the Supreme Court and Attorneys General manuscripts collections such as: Roy H. Beeler Papers, 1904-1954; John Catron Papers, 1813-1918; Walter Wagner Faw Papers, 1819-1956; Horace Harmon Lurton Papers, 1860-1914; among others. Governor’s Papers (legislation and laws).